Carly Fiorina’s new role in the GOP primary: Attacking Donald Trump. 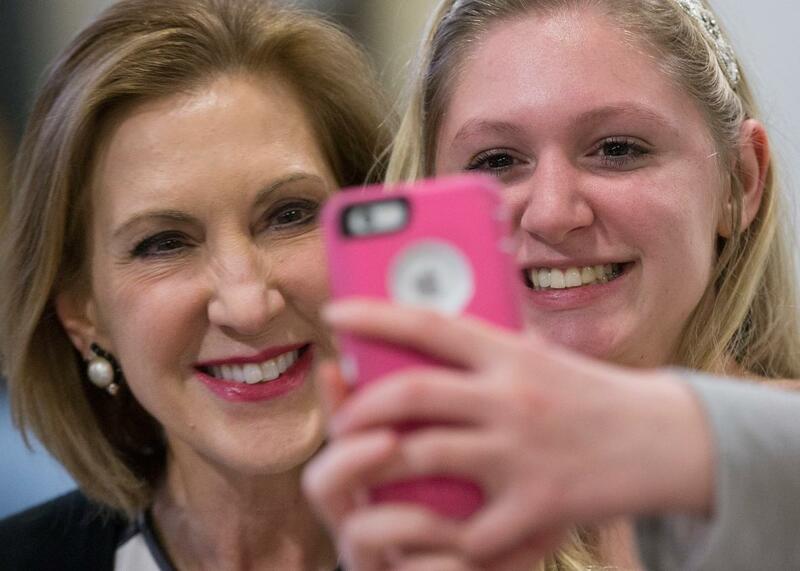 Carly Fiorina poses for a selfie with a young fan at a campaign event on April 24, 2015 in Tiffin, Iowa. Carly Fiorina built her campaign for the Republican nomination on the idea that, as a woman, she’s uniquely qualified to attack Hillary Clinton in the general election. It turns out, though, her bigger selling point for her party may be who she can attack in the primary: Donald Trump. On the campaign trail to date, attacking Trump hasn’t ended particularly well for anyone but Trump—as Lindsey Graham, Rick Perry, and Scott Walker can attest to. But Fiorina has so far avoided the Trump-ing that usually follows such attacks. The best The Donald’s been able to muster was this (for him) relatively muted response on Twitter: “I just realized that if you listen to Carly Fiorina for more than ten minutes straight, you develop a massive headache. She has zero chance!” For anyone prone to see his Kelly comments as blatant misogyny, that tweet didn’t help his cause. Fiorina’s attacks are coming at an opportune time for both her and her party. For Fiorina, they offer the chance to turn a dominating performance at the early Fox News debate into something more lasting. As FiveThirtyEight’s Harry Enten points out, Carly was the only Republican hopeful to see her support grow in the first seven polls conducted after the Cleveland debates. If the night had a winner, then, she was it. But that means little if she can’t extend and preserve that momentum to snag a spot on the main stage at the second GOP debate, which is being hosted by CNN next month. Meanwhile, Fiorina’s attacks hold even more promise for the Republican Party, much of which is understandably fretting over Trump’s remarkable staying power. As I explained earlier this week, Hillary has found a clever way to use Trump and his female-unfriendly comments against the entire GOP field by pointing out that, caustic tone aside, many of them are even more conservative on issues of women’s health and abortion than Trump actually is. That’s an image that could be difficult to shed for the party’s eventual nominee come the general election. Fiorina won’t completely neutralize Clinton’s attacks, but as the only other woman in the race, she represents Republicans’ best chance of dampening the blow.